Kent Smith is a friend of mine and the co-author of the book, Please God Save Us. He is also an elected school board member for Euclid City Schools and works for the Cuyahoga County Prosecutor writing grants, among other things. Kent posted this essay on the Facebook page he and his co-author, Derek Hess, share for their book and gave permission to repost it. The original can be found here. Today, Kent and Derek attended events at Kent State University marking the 40th Anniversary of the Kent State Massacre. Four students were killed by the Ohio National Guard while protesting the Vietnam War; the protesters were unarmed. I hope you enjoy this piece written by Kent, and consider buying a copy of the book. In addition to thoughtful essays, it contains provocative art by Derek Hess. Because it was the beginning of the end of the Vietnam War. When unarmed protesters and innocent (just on their way to class) students were killed at Kent State University on May 4, 1970, it broadly undercut support for the war in Vietnam. 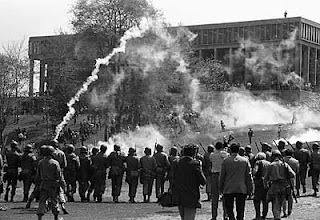 On Monday, May 4th (40 years ago) Kent State students gathered to protest their government’s escalation of a war and four of them paid for it with their lives. And, as a result, this nation began to question its principals and its priorities. One of the critical dynamics of America at that time was that war protesters were despised. Think about it. America — the nation — had a past of military heroics. Just 25 years earlier, we stopped Hitler and had saved the world. Our US military had only fought “noble” battles. And now those teenagers and students were questioning our nation. Who are these damn kids? After May 4th, student protesters became sympathetic figures who were acting patriotic, instead of class-cutting babies who needed a haircut and a shower. What young America had realized was that this battle - based on political ideologies on a peninsula in Southeast Asia - was not worth their lives. Remember the military draft had been reestablished just 5 months earlier. And just 5 days earlier (4/30/1970), President Nixon had gone on national television to announce that the US military had begun operations in Cambodia. The war was spreading. The war that Nixon said he would end was growing. A war that now had a draft and a war that Kent State students knew might demand their service. So they gathered, their voices grew, they questioned their government as their constitution allowed them to do. Then rifles fired and the bullets flew. And Allison Krause, Jeffrey Miller, Sandy Scheuer and William Schroeder – the oldest of which was only 20 years of age — were shot and killed by members of the Ohio National Guard. Nine other students were also shot but survived. 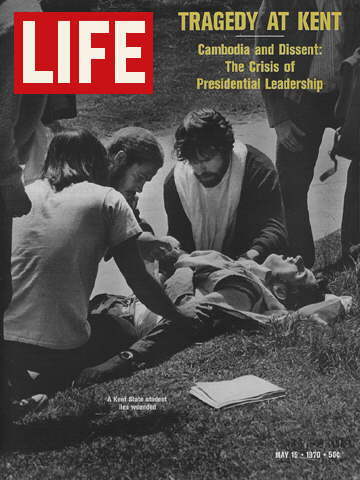 Public support for the Vietnam War began to collapse as news of Kent State shootings spread. 5 days later over 100,000 gathered in Washington DC to protest the Kent State massacre. And 40 years later, we from “Please God Save Us” are happy to be back tonight in Kent, Ohio to remember that wars should be questioned, dissent is patriotic and 20 is too young to die. *Images added by The Itch.